[ACT](VC) Limit Break 4 (This ability is active if you have four or more damage):[Counter Blast (3) & Soul Blast (2)] Put all of your rear-guards with "Liberator" in its card name on top of your deck, shuffle your deck, and look at five cards from the top of your deck, search for up to five cards with "Liberator" in its card name, call them to separate open (RC), and put the rest on the bottom of your deck in any order. So while you could say that it's better in a pure Liberator build, you could also argue that this Alfred makes mixing Libs and generics more viable because you can get more calls out potentially if you have your board state arranged well. Probably better pure, I just think that's an interesting clause. 9/10 it'll have an unlocking effect in it's LB as well since Ezel Stu probably bestowed his power into Alfred before leaving to fighter the invaders. Also I just want to reference that the returned unit do not return to the top and get shuffled, they return to the top and get recalled. Crunchyroll subbed it incorrectly, his name is actually Monarch Sanctuary (on the card it says モナークサンクチュアリ Monaaku Sankuchuari) not Black Sanctuary. The mistake came in because Aichi's voice was muffled by sound effects at the moment he rode. Also note that in the episode itself Aichi only CB'd and SB'd Liberators. It's definitely put all of your rearguards on the top of your deck and call five rearguards from the top, intended to either give you a fluctuating plus depending on how few rearguards you have or just give you absolute freedom of control for the rearguard circles and a power boost. This Alfred is probably a crossride, so unless he's part of a trend with Glendios of having a million skills and no Lord, then the +1000 power for each rearguard is also a part of the LB. It would be strange to have such a huge cost when +5000 is really all you get when your rearguard circles are already filled, so unlocking your Locked rearguards is likely part of the benefit. What's really baffling is that Blaster Blade Liberator is in the artwork and yet we have zero interaction with the card itself. 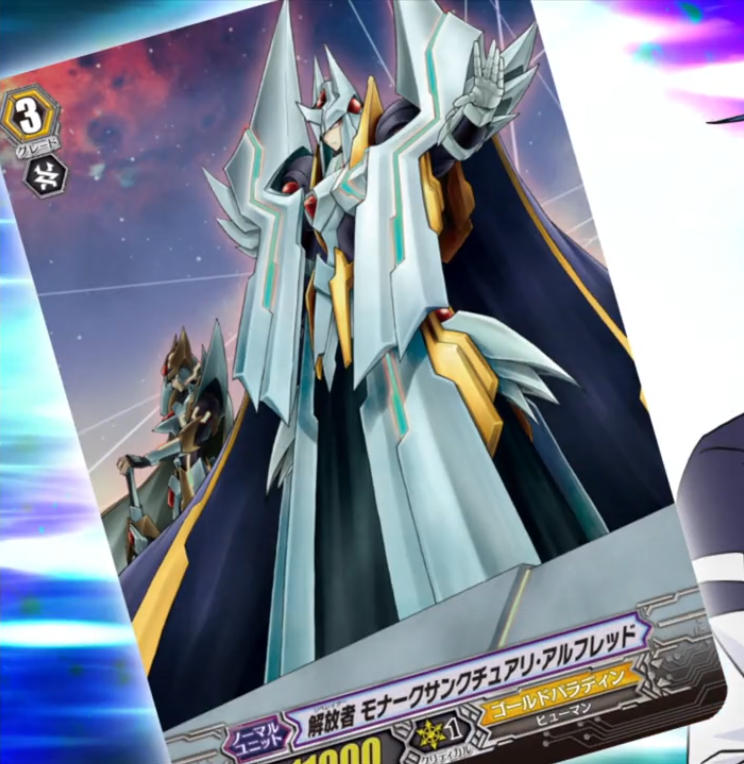 The episode did give some focus to Aichi riding BBL, so it could be that one of the soulblasts has to be Blaster Blade Liberator, but that's the opposite of what Liberator Sanctuary ought to be doing considering there's no consistent way to get Blade in the soul for Wingal/Star Rain right now...there's a lot of unanswered questions on this card. I get the feeling we don't have the entire picture and there's supposed to be something else happening with it later. If it's not a crossride that could shake things up considerably. hoping we eventually get the Royal Paladin version of this as a manga promo. Early shouldn't get shafted any further.